I think the game does not support that. At least I have never find that possibility from game menus. You could try to code program that extract those stats from savegame. I did that for a season games, but exhibition games use only one file for savegame. For season games savegame stats are stored in two different files. Exhibition game will be saved to *.NHL file. Maybe you can help me out a bit? This is the save game file from an exhibition game. When I looked at it with a hex editor there doesn't seem to be much in it. Not a whole game's worth of stats anyway. What do you think? Try this: Copy TESTGAME.NHL to new folder. Rename TESTGAME.NHL as GAME.SAV. Copy also these to same folder: KEY.DB, GSUMMARY.DB and TEAMS.DB. Copy stats_gametotxt.exe to same folder. Run stats_gametotxt.exe. I attach that here as a zip.file. It ask you GAMEID and ROUND, put some numbers there. Does 2 files appear to folder and if so, what are their content? Two files are created. One looks like a penalty/scoring summary. The other lists a bunch of players with what appears to be stats, but I'm not sure what they are. Yes, game summary seems to be working and at some point gamesave too. I think info is there, but program needs some modification. I put C++ source code here, hope you can figure out how it works and you manage to change it. Thanks for the help and the source code but my programming skills are in VB only. Code is actually very simple, I belive you figure it out if you have used any programming language. You can pick up addresses from my code and make your own by VB if you want. 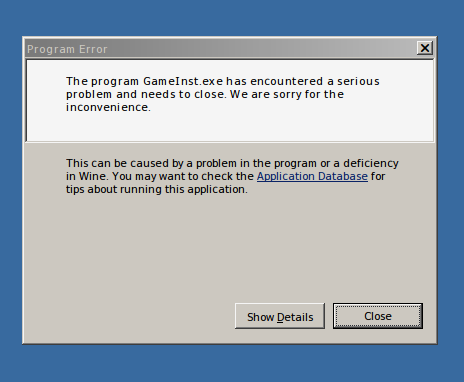 Wine throws up a serious error the moment I launch the application. ... which is? Can you google it? This is an example of the error that I got. What can you do to find out more about the problem? I programmed this for Windows. There could be tons of reasons why it would not run on wine, cannot help you there. There is a source code available on this thread if you can and want make your own version to other platform.